100% BPA FREE NON-Toxic Tritan Co-polyester reusable eco-friendly plastic bottle body, Food Grade PP material lid, Food Grade Silicone seal ring. Best Water Bottle which is do no harm to our body and it is environmental friendly. Suitable for both warm and cold beverages (-10 to 110℃). No "plastic" taste at all. 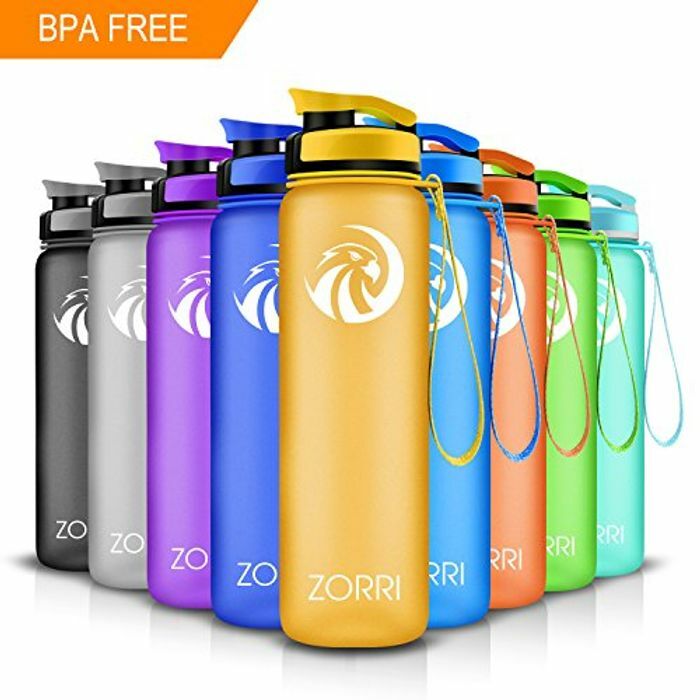 UPDATED 100% LEAK PROOF DESIGN : ZORRI Outdoor Sports Water Bottles comes with Updated features include 100% leak-proof loop top, ergonomic flip cap, and Practical nozzle, avoiding leaks, spills or dust. Wide mouth opening is easy to fill with ice, fruit, and making cleaning much easier ( and it comes gift of a clean brush). DURABLE FILTER LAYER & VOLUME MARKINGS : Available in three size 20oz/600ml, 28oz(800ml), 36oz(1000ml), marks with ounces and milliliters. Capacity is enough sure to get the water your daily hydration needs. It has a filter that comes in and out on the top, preventing ice directly into your mouth, make its ice has shrunk, and also, you can use it as a fruit infuser, add all of your favorite fruit, like lemon/watermelon/strawberry/mint etc. LIFETIME WARRANTY: We stand by our quality and want you 100% happy with this water bottle. Customer satisfaction is our priority that we are providing with a 30-day money back guarantee & a Lifetime Support Warranty that ensures product quality and protects your purchase. It performs up to better than any other brand of sports water bottle.